Taberna Tosca is a petiscos restaurant (the Portuguese version of “tapas”), located in Cais do Sodré. In the past, this was a difficult area in Lisbon, a zone where the sailors use to find themselves in whisky and brothels. This situation began to change 5 years ago, and now it has become the most alive area of Lisbon at nights. 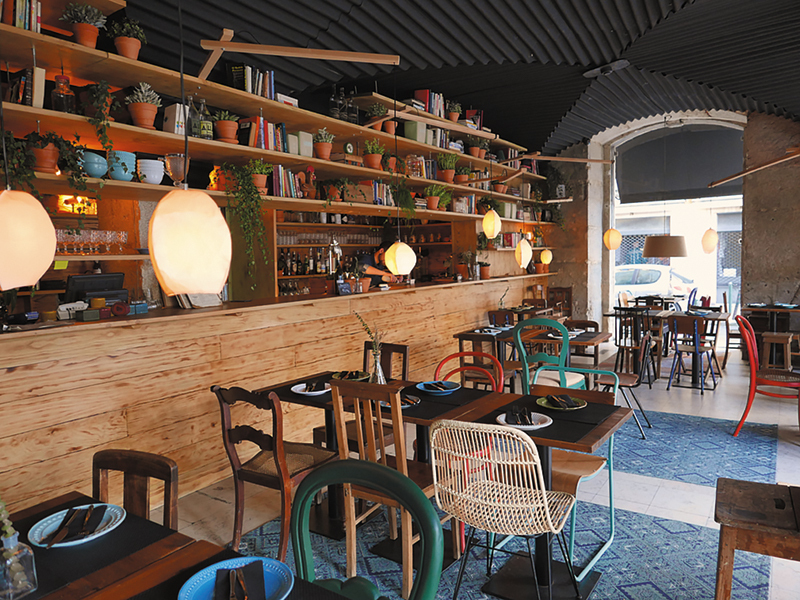 This restaurant occupies a corner of PraÇa de Sao Paulo, from which it’s the access. The huge stone arches with glass make the place a total showcase. The main goal therefore of this project was to emphasize such an interesting space, as well as to transform it into a cosy place both at day and at night. Clients asked architects Bárbara Bardin & Julio Cano to design a space that could be felt as a Portuguese home. The solution was very simple, just with one material, the wood, a huge shelf would be created to embrace all the space, divide the client zone from the serving areas and to give warmth to the ambient. In this shelf would be displayed objects, lamps, plants, old books, etc all of them bought in different vintage markets of Portugal. Another important point was to deal with the privacy of each table and at the same time with an organization freedom of the place depending on the client’s affluence. For this, architects designed a simple rotating lamp system made of wood that would be able to go after each table admitting all the freedom wanted. The actual lamp, made of painted paper, was hand-made by a Spanish artisan who patronized each lamp differently. To end up this home feeling, architects disposed a natural wallpaper to mime with the real plants of the place, and bought some acrylic carpets with traditional motives. The chairs, all different, and second hand were bought in the vintage markets of Lisbon, some of them were painted and customized.